New York, New York – Ameringer | Yohe | Fine Art is pleased to announce the opening of a two-part exhibition of recent paintings and pastels by Wolf Kahn (b. 1927). Wolf Kahn: Sizing Up opens with a public reception for the artist on Thursday, April 26th. A fully-illustrated two-volume publication with essay by Karen Wilkin will accompany the exhibition. The first part of Wolf Kahn: Sizing Up will focus on the artist’s recent large-scale paintings (some of which are almost eight feet wide; among the largest works of his career). In her catalogue essay, Karen Wilkin describes these paintings as a “group of bold surprising pictures… the open fields and gentle thickets have all but vanished. In place of this familiar farm landscape are confrontational expanses of generously scaled, vigorous, multidirectional marks, often white against intense color, that demand to be read as potent equivalents for growth, wild places, and relatively undisciplined nature.” The second part of Sizing Up, an exhibition of related pastels, will open on June 7th. 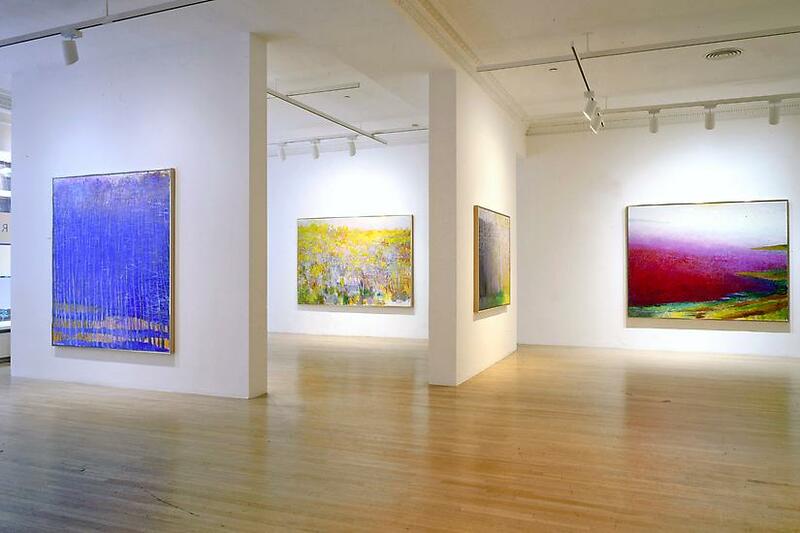 Wolf Kahn’s paintings and pastels are characterized by their unique and gorgeous color—a trademark of the artist—as well as their blend of spontaneous realism and American Impressionism with the formal discipline of Color Field painting. Wolf Kahn was born in Stuttgart, Germany in 1927, arriving in the United States in 1940. After serving in the US Navy, he studied with Hans Hofmann in New York and in Provincetown, where he became Hofmann’s assistant. His first one-man show was at the Hansa Gallery in 1953 (it was reviewed in ArtNews by painter and critic Fairfield Porter, who wrote “the excellence of this first exhibition… comes as no surprise”). His work has since been the subject of numerous national and international exhibitions. Wolf Kahn lives and works in New York City and in Vermont, on a hillside farm which he and his wife, the artist Emily Mason, have owned since 1968. Wolf Kahn’s work is included in many important museum collections, including The Metropolitan Museum of Art, the Whitney Museum of American Art, the Museum of Modern Art, and The Jewish Museum in New York City; and the National Museum of American Art in Washington, DC. He is a member of the National Academy of Design and the American Academy of Arts and Letters, and is the recipient of awards that include a Fulbright Scholarship, a John Simon Guggenheim Fellowship, and an Award in Art from the American Academy of Arts and Letters.